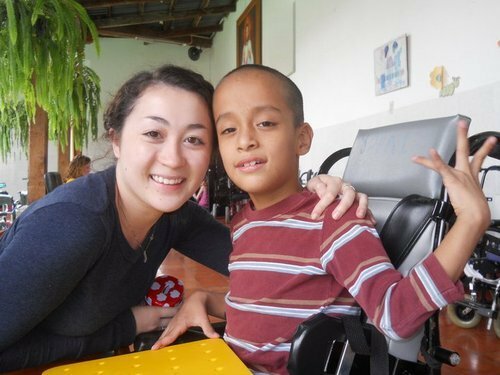 I've grown very attached to the kids here at Obras Sociales del Santo Hermano Pedro. They each have such distinct personalities. Today, I'd like to share about the kids I've connected with most. 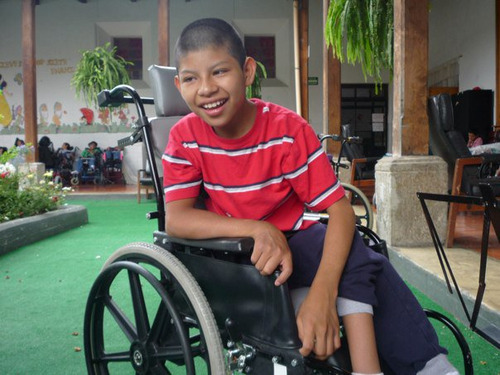 Carlitos: He can't speak and has little control of his movements, but I have grown to really love this little boy. He has the brightest eyes and actually looks eerily similar to the painting of Jesus in the convent. When I hold him, he looks up at me, confused, but content. And when I talk to him, he moans back in an effort to communicate with me. Then, he sighs, and laughs, and I just can't get enough of it. Henry: Soft spoken, sweet Henry is probably the most developed boy in the ward. For the first week of my residency here, I didn't meet him because he was away for his bi-annual month long visit with his family in the East. Although his brain is totally developed and advanced, his disorder shows through his hands, which he cannot use. When he returned from home, I spent an afternoon with him coloring and he ended up getting more chalk on me than on the ground! But he apologized (in English) and we both laughed about it. He even drew another chalk drawing, this time on paper, and gave it to me as a gift. Then, I wheeled him around with his directions (he could say "push", "left", "right", and "faster" :)). Lesley, a woman from the UK who has permanently moved to Antigua to work in the hospital, explained to me that he has learned English by listening to the English speaking volunteers who have spent time with him. I think that is so amazing. Maynor: Another one of the more further along boys in the ward, Maynor wheels around like he owns the place. He is from a region in Guatemala where a specific dialect of Spanish is spoken, so he and I share that we speak pretty broken Spanish. But he doesn't let it inhibit him. He is so curious. He constantly asks me, "¿dónde tá Dori? ", a broken way of saying "where is Midori?". I think he knows he is being silly asking ME where I am. But I think he really means it when I don't have my bassoon out and he asks, "¿dónde tá fagot? ", "where is the bassoon?". Rosy: Blind and deaf, 3 year old Rosibely is one of the more sick children in the ward. When studying the board posted that listed each of the patients and their various medical issues, I immediately noticed Rosy's and was concerned. I was completely clueless as to how I could connect with someone blind AND deaf. But one day during a performance, I noticed her in the corner slumped over and bored. She almost look scared. I knew I couldn't leave the ward another day and not give her a chance to connect with our music. As to not scare her even more, I approached her slowly and gently tapped her leg. She perked up and could tell I was there, ready to play with her! I leaned over and softly played some low notes on the bassoon with my bell resting on her tiny thigh. She cocked her head, widened her eyes, and started to clap and giggle. I couldn't believe it. I continued to play and even played as much as a 5 minute etude, the whole time with her laughter as my accompaniment. This experience taught me so much. 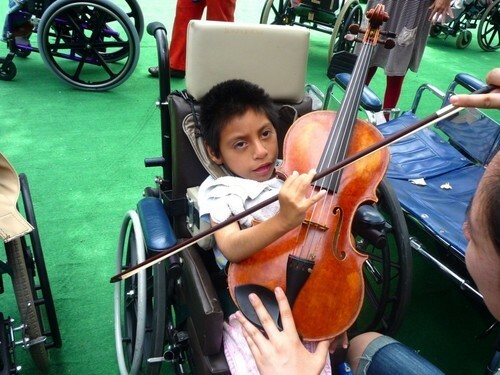 Music really is a language that everyone can speak when given the chance. So really, if I could make classical music accessible to someone with 2 of their senses gone, no one has an excuse not to at least give it a try.